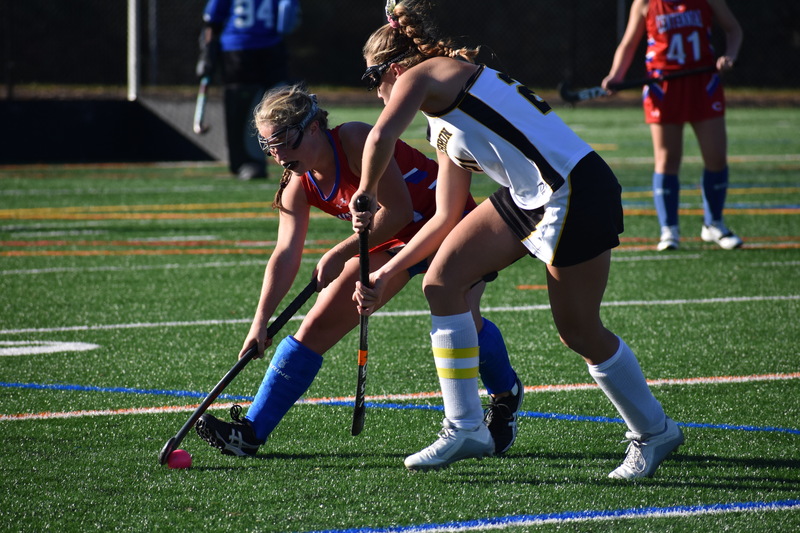 On Monday, October 30, the Centennial Eagles field hockey players wrapped up their season and play-offs run with the 4-1 defeat against their rivals, the Mt. Hebron Vikings. For the seniors, this might be the last time they step out on the field as an Eagle, so they came ready for a fight. The rest of the team knew they had to play their hardest if they wanted to continue their journey with their senior teammates. The Eagles won possession of the ball at the start of the game, and within only a couple minutes, senior Lauren Muma scored the first goal for the Eagles with an assist coming from senior Camden Blevins. According to Muma, “I am sad that [the season] is over, but it was such a fun season and being able to score with Camden was amazing.” The Vikings were able to score a goal, tying up the game. Both teams defended well, and the half ended with the score tied of one to one. Once the teams regrouped after halftime, both teams went in with new energy, and within the first 5 minutes of the second half, Hebron had scored once again, taking the lead 2-1. The Eagles offense and defense played well throughout the game, but unfortunately, the Vikings scored two more times within 10 minutes, and the final score was 4-1. The 2017-2018 season was an amazing one for the Centennial Eagles, going to the third round of play-offs, and ending the season with an great game. 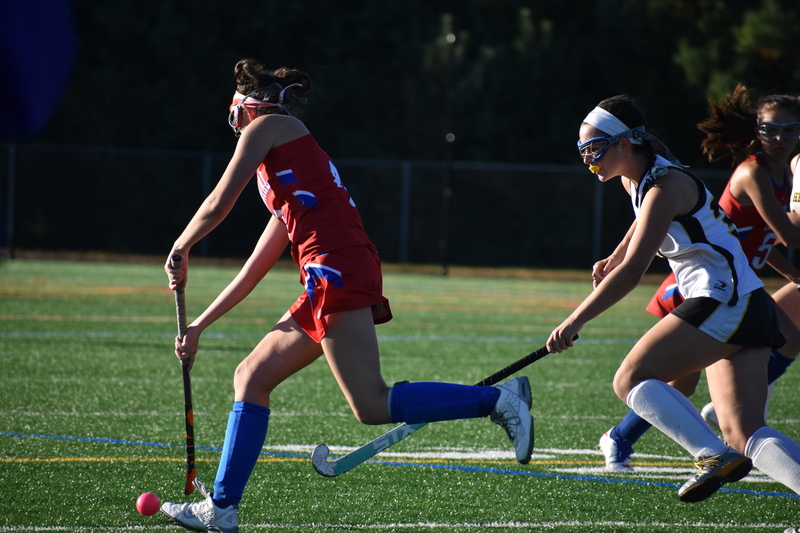 On Thursday, October 26, Centennial’s varsity field hockey team played Long Reach in the first playoff game of the season. 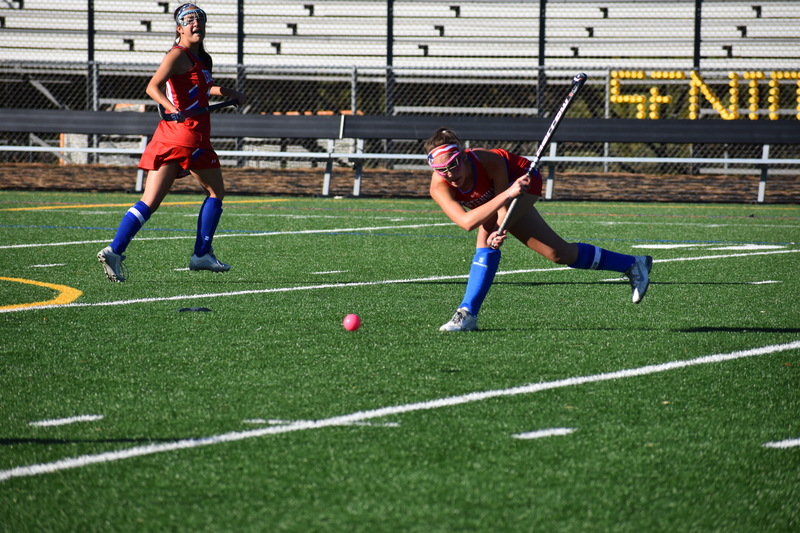 Within the first seven minutes, Centennial was up 3-0, with senior Lauren Muma having scored all three goals. By halftime, freshman midfielder Lily Sullivan had scored another goal for the Eagles. However, in the first three minutes of the second half, Long Reach scored bringing the score to 4-1. As the ball moved up and down the field intensely, players on both teams grew tired, yet more determined than ever. Long Reach scored for the second time after a fast break down the field. Once again, Muma stepped up and scored another two goals to end the game, bringing to a final score of 6-2. The Centennial Eagles JV football team was prepared to end their trying season with one final home game on October 27 at 7pm. Confidently stepping onto the field, the Eagles played with great heart against Hammond High School. Due to their perseverance and determination until the last second, the Eagles ended the season with one win, beating Hammond by 14 points, with the final score being 27-12. Touchdowns on Centennial’s part were scored by Justice Murrell, Anthony Mathews, and Sihier Coleman. Due to having to dismantle the varsity football program at Centennial, the JV football team had many adjustments to make, and many saw ending the season with a win as vital in boosting the esteem of the team. The Eagles are optimistic about the future of the program and the 2018-2019 season for both JV and varsity programs. After a season of dedication and persistence the Eagles will end their season 1-8. Centennial’s Anime Club is a place where people who enjoy Japanese shows gather. If you are interested in learning more come down to Room 305 on Wednesdays right after school. Anime is a type of Japanese film and television animation with themes similar to colored comics. The group prepares for the annual Otakufest that they hold at our school and goes to Cos-Con to promote the club. The club is led by seniors Tracy Yang (president) and Andrew Lee (vice- president). The other people on the board are junior Reina Maeda, sophomore Aki Parrish, senior Ranga Emani, and senior Todd Price. The club is sponsored by Hannah Elliot, a new teacher at Centennial. Anime Club is always looking for new members and will welcome anyone who wishes to join. If you want to learn more contact the club at chsanime@gmail.com or go to their Facebook page named Centennial Anime Club [HOCO]. Empire Mock Trial is a club in which students learn to debate with each other while gaining perspective on world topics and issues. The students of the club use critical thinking skills while simulating a real court case. From September 21 to 25, the students of this club attended an International Empire Mock Trial competition taking place in Atlanta, Georgia. The group, made up of 17 students including two team captains, competed against teams from around the country and the world in the span of five days, where they put their skills to the test in a case involving prison negligence. While in Atlanta, they also toured the CNN world headquarters and met with CNN10 host Carl Azus, who spent time with them and talked about working at CNN. The team had been preparing for the competition since June, but while Centennial did not end up coming in first, the trip was much more to them than beating their opponents. It was about team bonding, building their strengths and having fun. “It’s more than just getting a trophy at the end of the day,” said Kelli McDonough-Schlehr, Empire Mock Trial’s teacher sponsor. “They’re learning public speaking skills, they’re enhancing their confidence, [and] they’re also learning how to work as a team,” McDonough-Schlehr said. Mock Trial is a team-oriented activity, which means it’s not just one person’s score that relates to how the team does. Everyone’s participation matters, and when someone faults, the support system falls into place. On Thursday, October 26, 2017, Interim Superintendent Dr. Michael Martirano met with high school journalists for a press conference at the Board of Education to discuss topics that students were concerned about. Students brought up topics such as the promotion of mental health in the school system, dropout rates, language barriers, overpopulation and redistricting, and technology in the classroom. When asked about the modification of the vision statement to include the emotional well being of students, Martirano confidently stated that he believes that there needs to be a balance between academic work and achievements as well as students’ emotional well being. When asked about overpopulation and redistricting, Martirano relayed that the three most overpopulated high schools are Centennial, Long Reach, and Howard. He stated that they intend to offer opportunities to relocate students from those three schools to schools like River Hill and Oakland Mills, which have empty or low-attendance classrooms. There are four viable plans to manage overpopulation and redistricting currently being reviewed by the Board; however, Martirano shared that the school system does not intend to redistrict the entire county until construction of High School 13 is underway. According to Martirano, the school board recognizes these issues fully and is looking to make change, but technology also equals money. Martirano ended the conference with closing statements about his vision for HCPSS. On Wednesday October 25, Centennial High School hosted the County’s Cross Country Meet, with the competing schools of Atholton High, Centennial High, Glenelg High, Hammond High, Howard High, Long Reach High, Marriotts Ridge High, Mt. Hebron High, Oakland Mills High, Reservoir High, River Hill High, and Wilde Lake High. There were 4 races: JV boys, JV girls, Varsity Boys, and Varsity girls. Centennial placed 3rd overall in the boys Varsity race, with senior Steven Mitchell placing 14th, and senior Greg Costello placing 3rd, both making the top 15 for the boys. The girls, placing 2nd overall, had 3 girls in the top 15: junior Cora Blount placed 11th, junior Alison Betler placing 6th, and senior Kirsten Wikner placing 5th. This was a great race day for Centennial, because of their top placement on the scoreboards, and was overall a great day for the Cross Country Eagles. The Varsity teams will continue against Reservoir and Oakland Mills on November 2, at Centennial for the regional championship.